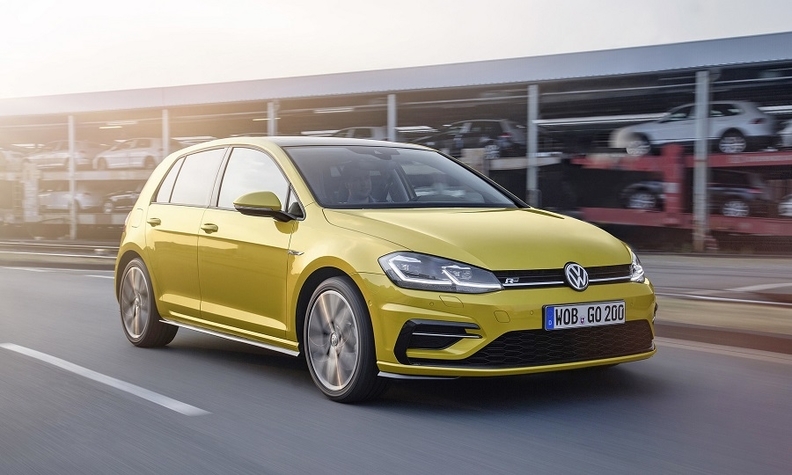 The new Golf's design will keep the classic hatchback lines of the current and previous generations but have sharper bodywork lines, reports say. The current Golf is shown. WOLFSBURG -- Volkswagen will delay the sales launch of the new Golf, Europe's top-selling car, until next year as it finishes development of the hatchback's advanced digital features. VW is giving the Golf a fully digital cockpit with features such as permanent connectivity to make the compact car more attractive as more customers switch to crossovers or premium hatchbacks such as the Mercedes-Benz A class and BMW 1 series. But the advanced technology is causing technical bugs so the Golf's launch has been pushed back, the Bild newspaper said, citing boardroom sources. VW said there were some technical issues that need to be rectified in the new Golf due to the advanced nature of its technology but the automaker denied the car was being delayed because of the glitches. The Golf will have its market introduction at the start of next year to avoid a launch just before Christmas when sales of new cars are slow, VW said. "We think it's better to come early next year with a full throttle offensive. It doesn't have anything to do with production. It's a sales decision since you don't try to put cars under the Christmas tree when no one is paying attention," VW brand's sales and marketing chief, Juergen Stackmann told Automotive News Europe. VW had originally planned to debut the Golf at the Frankfurt auto show in September and premier the I.D. battery-powered hatchback, the first model in the automaker's new lineup of mass-market EVs, some weeks later. The automaker has now decided to change those plans and focus on the I.D. in Frankfurt. The Golf unveiling to the media will come after the Frankfurt show "to give the eighth generation Golf the exclusivity it deserves," Stackmann said. In January, Karlheinz Hell, VW band's compact cars boss, said the new Golf would take VW "into the era of fully connected vehicles" with extended autonomous driving functions. "It will have more software on board than ever before. It will always be online and its digital cockpit and assistance systems will be the benchmark in terms of connectivity and safety," Hell said. Hell gave no more details. Motoring press reports said higher-end Golfs would not have conventional switches on the dashboard. Instead functions such as adjusting heating and headlights will be done on touchscreens. Golf sales in Europe in 2018 excluding the full-electric version fell 10 percent to 415,782, according to JATO Dynamics market researchers. Sales of the e-Golf rose 38 percent to 29,972. VW is expected to discontinue the electric Golf as the Golf-sized I.D. hatchback rolls out.